Praises and rave reviews are coming in for the book which will be out during Valentine’s week and we are counting down the days. 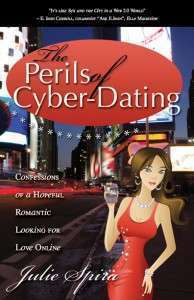 The book is a romantic tell-all memoir filled with hilarious, witty, and heartfelt stories spanning over 250 dates in almost 15 years online. As a pioneer in the Internet industry, I became the first on my block to put up an online profile. You will follow my journey as I skillfully navigate the web to replace what I thought was the love of my life and had to start all over again. ?Ever the “hopeful romantic” I will provide details on how to steer clear of “Mr. Wrong” and how to find “Mr. Right” and perhaps live happily ever after. 10% of the author?s net proceeds will benefit Step Up Women?s Network.? About Step Up Women?s Network? Step Up Women?s Network is a national non-profit membership?organization dedicated to strengthening community resources for women and girls. Through teen empowerment programs for underserved girls, women’s health education and advocacy, professional mentorship and social networking opportunities, Step Up educates and activates their members to ensure that women and girls have the tools they need to create a better future. www.suwn.org.